President Trump has made himself clear on climate change: He doesn't believe humans have much, if anything, to do with it. No number of hurricanes appears able to alter that. He's been just as fixed on other issues, like immigration, before making a sudden course change. The question grappled with by some observers is whether Trump could be coaxed into ditching his view that warming is a hoax, for a political payday. While Trump has shown he's willing to stiff-arm his conservative base to work with Democratic minority leaders Sen. Chuck Schumer of New York and Rep. Nancy Pelosi of California on a deal to allow children illegally brought to the United States to stay in the country, the idea that he'll pivot on climate change remains far-fetched — though not impossible. "Climate policy doesn't look like the next verse of the 'ballad of Chuck and Nancy,'" Kevin Book, managing partner at ClearView Energy Partners LLC, said in an email. "Deregulatory efforts continue at the Interior Department and EPA. It would seem they are not singing from the same psalter, but maybe the climate verse of the bipartisan hallelujah chorus hasn't been written yet." So what would have to change? One major thing: Climate change would have to matter to more American voters. And if there's anything Trump's election proved, it's that climate change didn't register. While 38 percent of voters cared a "great deal" about climate change, just 15 percent of likely Trump voters said they felt that way, according to an October 2016 Pew Research Center poll. "We worked really hard at LCV to elevate the issue of climate change during the 2016 election cycle, and from where we sit, it did not break through," said Sara Chieffo, vice president of government affairs with the League of Conservation Voters. Trump's views, after all, were not secret. It's often remarked that there's a "tweet for everything" when Trump makes a policy stand and someone can dredge up a years-old missive that criticized President Obama or someone else for doing something similar. On climate change, though, there have been more than 100 tweets. And they've all aligned with the policy and regulatory actions, including withdrawing from the Paris climate accord, that the Trump administration has taken. "Trump's views have been pretty consistent on climate change during his presidency," said Ron Bonjean, a GOP strategist. He noted that deals on immigration made sense given the presence of the issue on the campaign trail. Climate change was barely mentioned. "Until this issue becomes a populace one that raises to the level of serious concern like top-tier issues of jobs, the economy and health care, it's unlikely this will be a serious focus," Bonjean said. Hurricanes Harvey and Irma have renewed interest in Trump's views on climbing temperatures. The president has toured the devastation in Texas and Florida, meeting victims along the way. While his administration has said discussing climate change would be insensitive in the recovery period, he has nonetheless faced questions about it (Climatewire, Sept. 12). "We've had bigger storms than this," Trump said last week in response to whether climate change contributed in some way to Harvey and Irma, which many scientists said were made stronger by rising temperatures (E&E News PM, Sept. 14). Trump ignored a follow-up question on whether he agrees with climate scientists who say humans are largely responsible for warming the planet. 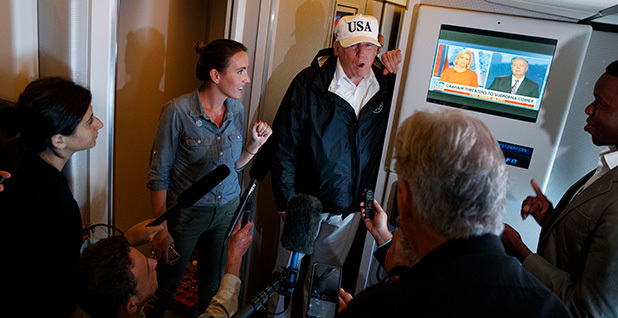 "I don't think he thinks twice about it because he doesn't see it as something that people think about on a daily basis, much less people who are getting through a hurricane," said Ford O'Connell, a Republican strategist who backed Trump in the campaign. "He sees it as not a good use of his time. That's why he ignores it." Asked last week about Trump's climate views, White House press secretary Sarah Huckabee Sanders said, "The president has addressed this already. I don't think that it's changed over the last several weeks." Some of Trump's past views, all encapsulated in tweets, include: "In the 1920's people were worried about global cooling — it never happened. Now it's global warming. Give me a break! "; "Do you believe @algore is blaming global warming for the hurricane? "; "It's extremely cold in NY & NJ-not good for flood victims. Where is global warming? "; and "The freezing cold weather across the country is brutal. Must be all that global warming." And a greatest hit: "The concept of global warming was created by and for the Chinese in order to make U.S. manufacturing non-competitive." To be sure, some hoped Trump would pivot on climate after winning the election. But analysts made similar predictions about most of his views. A New York Times interview shortly after the election contained perhaps Trump's most moderated climate perspective: "I have an open mind to it. We're going to look very carefully." After all, this was a man who ahead of the 2009 U.N. climate talks in Copenhagen, Denmark, signed onto a full-page ad in the Times with other business leaders urging climate action. Surely, some thought, moderation was in order after a brutal campaign (Climatewire, Nov. 14, 2016). But almost 11 months after his victory, those predictions amount to false guesses. "What communities in the Gulf Coast, Southeast, and Puerto Rico need is a recovery led by a President that leaves no one behind and rebuilds with recognition of the very real threats the climate crisis poses," Sierra Club Executive Director Michael Brune said in a statement after Trump's comments last week. "Instead, what they're getting is an ignorant showman who is lying to their faces. What's clear is Trump never got it. What's worse is he doesn't care." Bonjean said Trump's re-election strategy around climate could change if voters in battleground states that are affected by storms start drawing connections between those events and planetary warming. So far, that isn't happening in a meaningful way, he said. Environmental groups and Democrats have tried for the past few elections to make anti-climate views a hallmark of extremism. Many will be watching whether those efforts combined with Trump's statements on climate factor into next year's midterm election. Chieffo said LCV's research showed Superstorm Sandy swayed voters when it hit just before President Obama won his 2012 re-election bid. She's encouraged that the public and media "are connecting the dots even more so than" during Sandy. That, in turn, could spur more interest in climate change in down-ballot and gubernatorial elections scheduled before the 2020 presidential contest. "We're working to elevate climate at all levels of the ballot," Chieffo said. Some Republicans have pushed back against Trump on climate. The president's actions as well as those of U.S. EPA Administrator Scott Pruitt are "fueling the growth" of the 56-member House Climate Solutions Caucus, half of which are Republican, said Ed Maibach, director of the Center for Climate Change Communication at George Mason University, in an email. The chance that a climate reversal could lift sagging political fortunes is what keeps Maibach's hope alive. "He seems to be leaving open the possibility of a pivot, but he's unlikely to do so until he sees an opportunity to make himself look like a leader through his action," Maibach said. "I would be surprised if he makes it to the end of his term without some sort of pivot." Book pointed to the administration's handling of the Paris withdrawal as that potential open door for a climate turnaround. He noted that while the White House rejected the global climate pact on June 1, the State Department in its letter of intent to exit the deal offered terms of "re-engagement." The United States, meanwhile, cannot officially exit the Paris accord until the day after the 2020 election. Despite the timing, though, the politics of climate change remain fixed in place for now, Book said. "[N]either climate change nor energy itself tend to be reasons why Presidents win or lose elections," he said. "A climate activist can lose in an activist country and a climate denier can win in a denier country. Most of the world — and virtually all of politics — has a shorter horizon than the timescale of climate change, hurricanes notwithstanding."